Smoked salmon canapes are sophisticated, effortless and perfect for a party. For those that don't know a canape is a thin piece of bread topped with your choice of savory foods. The canape recipe below, which I adapted from Jamie Oliver, mixes smoked salmon and tangy horseradish. Though it is a combination I hadn't tried before I can attest that this dainty appetizer is quite delicious. Add prepared horseradish to crème fraîche until desired tang is reached. Season with salt and mix well. Set aside. Cut ciabatta into thin slices and toast. Drizzle with extra virgin olive oil. Top with smoked salmon. Add a dollop of horseradish crème fraîche to each toast and top with radish sprouts. Finish with a drizzle of extra virgin olive oil. Mmmm! I want some of this right now! Looks and sounds awesome! I wish I had this snack right now! Looks light and yummy, and smoked salmon is so nutrient dense! I've done something similar with cream cheese instead of horseradish. I'll have to try it this way! Yum! These look really delicious and I love the addition of creme friache! Oh yes please! I love ciabatta too! What a perfect appetizer or for me, meal. Love the zing of horseradish. Lovely. Salmon is a favorite! I have never (even thought!) to use horseradish with smoked salmon and I think your combination would be so flavorful. 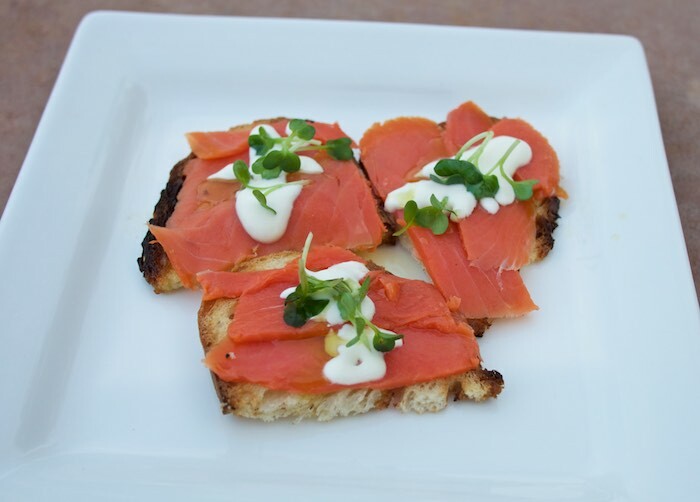 Smoked salmon is such a strong flavor and the creaminess of creme fraiche w/horseradish, YUM! Pinning will be trying this over the weekend! smoke salmon always looks so good and elegant doesn't it? MMm yum! I do love smoked salmon, and we grow some of the finest salmon where I live. A great recipe! Just love smoked salmon how interesting you added horseradish. Must try! This is my kind of snack/canape. Love every ingredient. I add horseradish-cream to so many canapes.. It's perfect here. Love the pics. Looks so tasty. and is!!! Smoked salmon is a big hit in this household. It is one of my daughter's favorite, love the horseradish cream to go with!! Such a perfect hors d'oeuvres, both elegant and delicious! A great take on a classic canape, love using horseradish. What a wonderful appetizer! Or even a light lunch with a salad and a seltzer. Mmm, yummy and healthy. Great recipe! Such a great appetizer! And so easy, too. Mmmmm....this looks so good (I'd probably turn it into a meal)! mmm YES! Love this little appetizer! This sounds absolutely wonderful! I adore smoked salmon, and the addition of horseradish sounds terrific! I love, love smoked salmon and these canapes are right up my alley! This is such a perfect combination of flavors! The paleo diet can be defined as the natural food which was being used by the ancient people during the Paleolithic era. It is also called Paleolithic diet, Caveman diet and stone-age diet. Cavemen used to get the food by hunting animals and gathering fruits, nuts, vegetables etc. These look delightful! I had to peek at the ingredients list to see what the little shoots you used were. I haven't tried radish shoots before -- but they look a lot like pea shoots, which I love. OMG... I love smoked salmon!!! And this presentation looks party-perfect.